Our overnight bus ride on the Fun Bus ending at 7:00am went we arrived at Rockefeller Center in the heart of New York City. 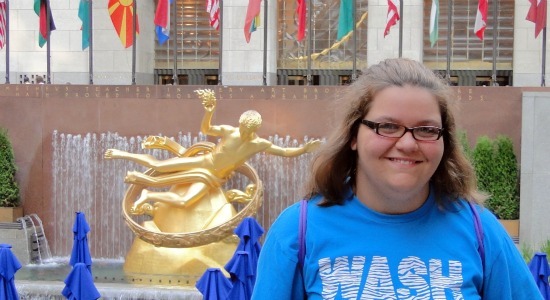 Click here to see my photos from Rockefeller Center. We had thirteen hours to explore the city. For the first half of the day Sarah and I stayed together in a group with Jenny, Any, Bob, Robin, Patty Jo and Linda. After catching a glance Ann Curry of "Today" through the glass, we were walking down Fifth Ave. to the Empire State Building. 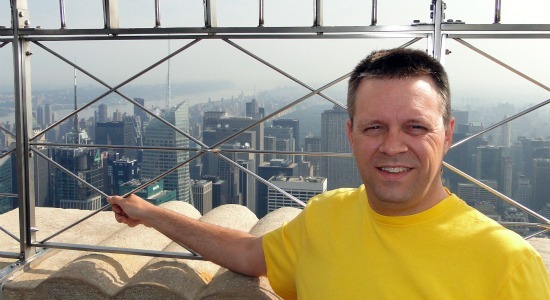 Click here to see my photos of the Empire State Building. We spent nearly an hour taking in the views from the observation deck on the 86th floor. The views were a little hazy. Next we walked west towards the Hudson River for our tour on the water. On the way we saw Macy's, Time Square and got a quick bite to eat from and sidewalk hot dog vendor. 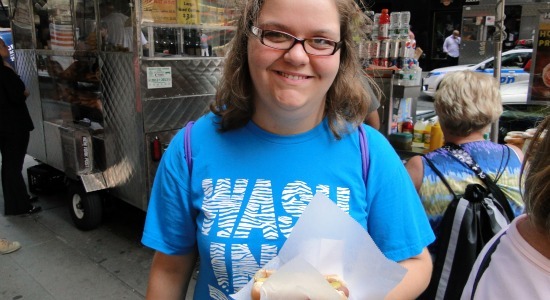 Do hot dogs taste better in New York City? Next we were off to the water tour. 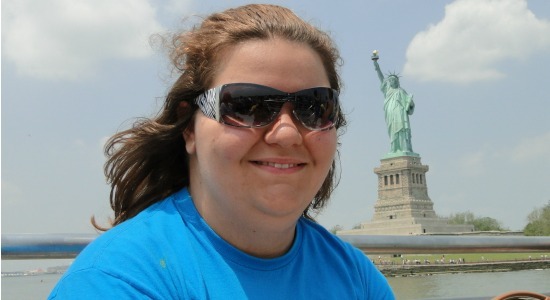 Click here to see all my photos of the Statue of Liberty. Click here to see my pictures from our Circle Line Sightseeing tour. At the foot of W. 42nd St. was Pier 83 and the Circle Line Sightseeing Cruises. Our two-hour tour began at 11:30am. We sailed down the Hudson River and past the Statue of Liberty. Then our cruise turned north up the East River to the United Nations Building before returning to Pier 83. Click here to see all my photos from Market Diner. 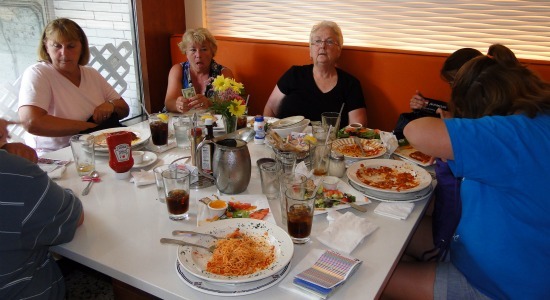 We had worked up quite an appetite. We found the Market Diner nearby on 11th Ave. I had the Calamari, Tortellini and Angel Hair Pasta. Sarah ordered Cheese Ravioli. We each had a salad as well. The rest of the group had a variety of dishes from burgers to chicken to soup. The food was great and the service was even better. It was a great New York experience. After our meal Sarah and I split up from the rest of the group and headed to Coney Island. It took about an hour to ride the subway through Manhattan and Brooklyn when we finally arrived at the Stillwell Ave. Station. Sarah and I walked around the perimeter on the park to the boardwalk. The area had a completely different vibe than Manhattan. Coney Island wasn't confined by the canyons of skyscrapers, it was open and wide. It wasn't slick and glitzy lick Time Square, it was old and gritty. But is was also full of energy, sunny, care-free and bright. And the breeze off the ocean felt great. We walked across the sand and waded in the Atlantic waters. 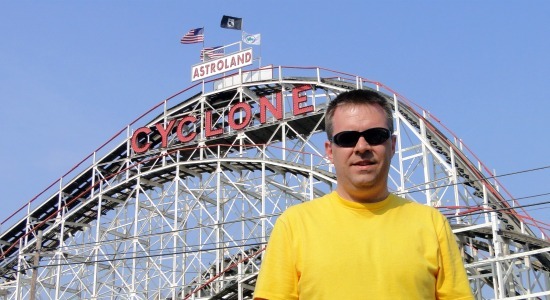 The whole purpose of our trip to Coney island was to ride the world famous Cyclone roller coaster. This classic coaster was on my bucket list for a long time. The iconic coaster with unique trains was a joy to ride. Fast and smooth, just like a coaster should be. Next we were back on the subway for another hour-long trip back to Time Square. 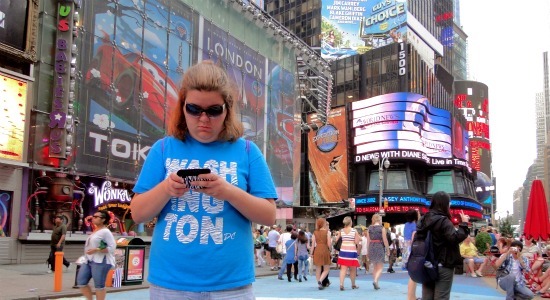 Click here to see all my photos from Time Square. We watched the crowds on people, the neon and LED signs and video screens. And we were invited to a taping of a Comedy Central special. Our time was short and we headed back to Rockefeller Center to meet up with the rest of our group for the ride home. Bob, Robin, Linda, Sarah, Amy, Patty Jo, Jenny and Me. We walked around a little while we waited for the bus. 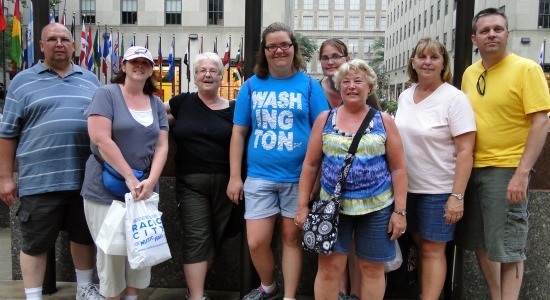 We all had a great time in New York City and we have sore feet to show for it.